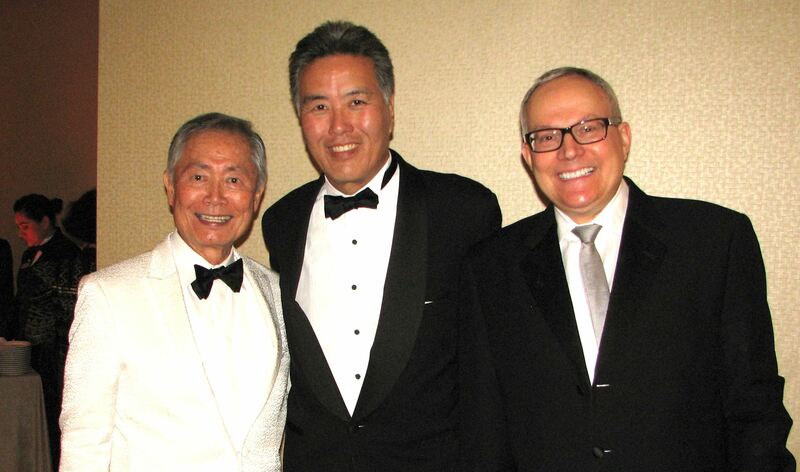 From left: Norman Mineta, chair of the JANM Board of Trustees; honoree Karen Ishizuka; JANM President and CEO Greg Kimura; honoree Robert Nakamura. 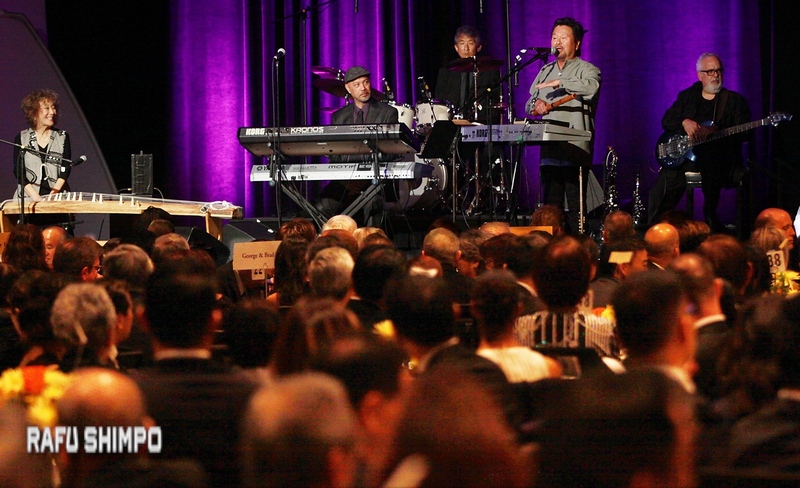 About 1,200 people turned out for the Japanese American National Museum’s annual gala, held March 19 at the Westin Bonaventure Hotel and Suites in Los Angeles with “Moving Images, Telling Stories” as this year’s theme. 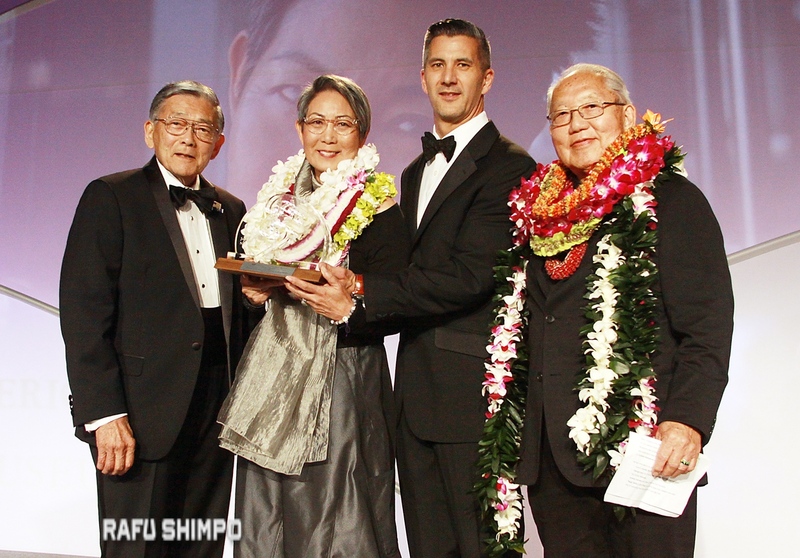 The museum’s inaugural Legacy Award went to the husband-and-wife team of Robert Nakamura, a pioneer Asian American filmmaker, and Karen Ishizuka, a respected scholar. They were brought on in JANM’s early days to help shape its direction, established its collection of home movies and video life histories, and produced several exhibitions and documentaries. Opening remarks were made by Norman Mineta (at microphone), chair of the JANM Board of Trustees, and JANM President and CEO Greg Kimura. Meanwhile, he said, two of JANM’s traveling exhibitions are drawing crowds — “Perseverance: Japanese Tattoo Tradition in a Modern World” at the Morikami Museum and Japanese Gardens in Delray Beach, Fla., and “Hello! Exploring the Supercute World of Hello Kitty” at the EMP Museum in Seattle. 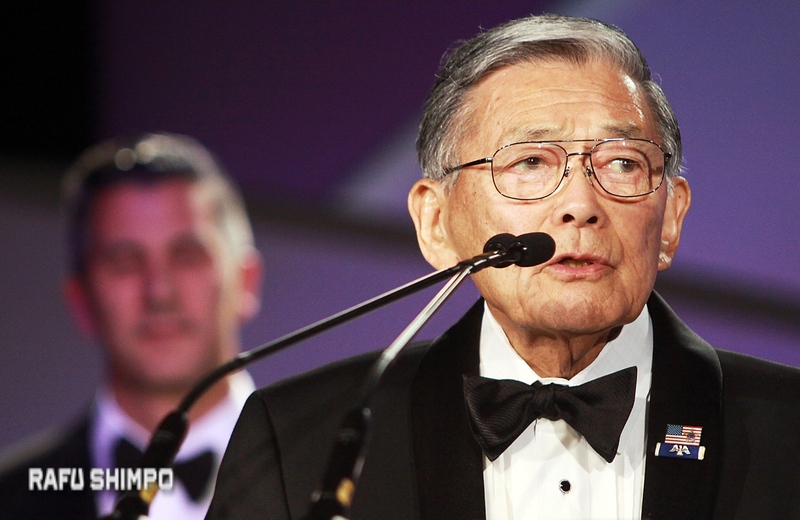 Former Secretary of Transportation Norman Mineta, chair of the JANM Board of Trustees, expressed his “personal appreciation and very deep gratitude” to the museum’s trustees, governors, staff and “legions of loyal volunteers” for their support. 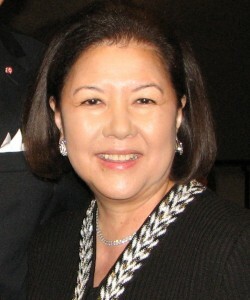 Greetings were also delivered by dinner co-chair Linda Horioka, a member of the Board of Trustees, on behalf of herself and co-chair Tammie Kanda, a member of the Board of Governors; and Kanetsugu Mike, executive chairman of MUFG Union Bank, who said the bank became a signature sponsor of the gala to express gratitude for the support it has received from the Japanese American community over the years. An “In Memoriam” video, which was followed by a moment of silence, paid tribute to notable individuals who have passed on since the last gala: May Fujino, Fred Yaichio Hoshiyama, Masaji “Mas” Inoshita, Susumu “Sus” Ito, Ben Kuroki, Masao “Mas” Matsumoto, Eleanor Edith “Ellie” Minami, Hisamiya Miyagishima, Tetsujiro “Tex” Nakamura, Ruth Ohmura Nishida, Susan Turner Purvis, George “Joe” Sakato, Dr. Paul Ichiro Terasaki, Dr. Richard J. Wood, Teruyo “Tootsie” Yoshimura, Rev. Dr. Takeo Uesugi, and George “Horse” Yoshinaga. “We are really grateful to be the first recipients of the museum’s new Legacy Award, especially because there are so many others who could easily be standing here in our stead,” Ishizuka said. Ishizuka continued, “Of the many staff, Irene Hirano, who was director and CEO during our tenure, had enough confidence and trust in us to let us work with very little bureaucracy and a lot of support. Clement Hanami has to be, I have to say, the single most important person at the museum. Without him all these years, the museum wouldn’t be where it is today. His talent, hard work and friendship have been invaluable. 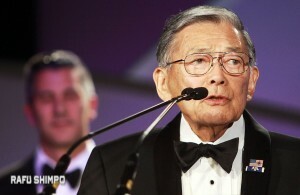 “Of the many board members, I’d like to thank those who stood up and voiced their opposition when the exhibit that I curated, ‘America’s Concentration Camps,’ was almost censured when we took it to Ellis Island, especially Sen. Dan Inouye, Bruce Kaji, Norm Mineta and George Takei. 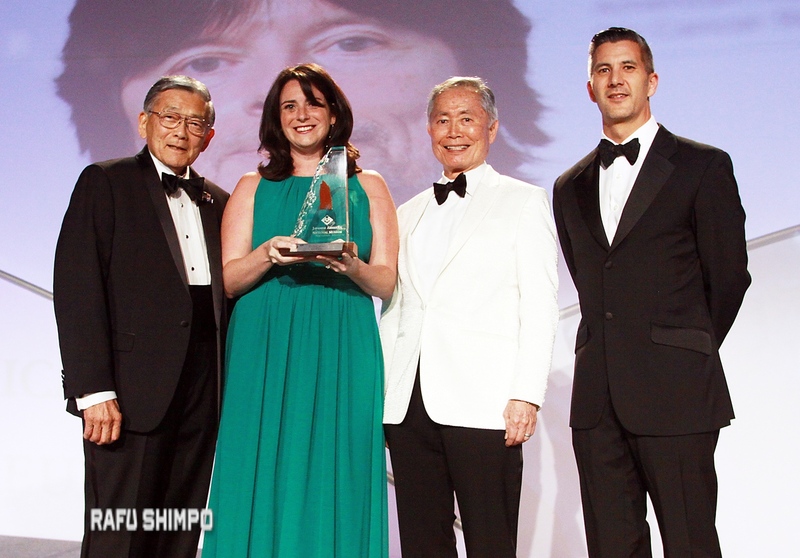 From left: Norman Mineta, chair of the JANM Board of Trustees; Jamie Annunzio Myers of PBS SoCal, accepting for honoree Ken Burns; JANM Trustee George Takei; JANM President and CEO Greg Kimura. In a videotaped message, Burns apologized for not attending, explaining that he was working on a number of film projects, including a documentary about Jackie Robinson that will air in April. “I’m honored to be the recipient of the museum’s very first Founders’ Award,” Burns said. “The vision that the founders articulated is a grand one. That you feel I’ve played even a small part in bringing it to life is very, very gratifying. “As a filmmaker, I’m always looking for that rare and perhaps not as well known archive. The Japanese American National Museum proved to be that place for me on more than one occasion. The museum’s remarkable collection of home movies has proved invaluable to me, and the fact that these resources are made available to everyone is even more important. Jamie Annunzio Myers, interim chief operating officer and vice president of education and community engagement for PBS SoCal, accepted on Burns’ behalf. Mineta said it was a happy coincidence that as a congressman he worked with her great uncle, the late Rep. Frank Annunzio (D-Ill.). “As the flagship PBS station in Southern California, PBS SoCal has the privilege of bringing Ken’s groundbreaking documentaries into all of your homes,” Myers said. “Ken is a masterful storyteller with an amazing capability to make you feel hopeful yet hopeless, inspired or disheartened, confused or enlightened, because he tells stories with depth that put the best and the worst of humanity on display. Irene Hirano Inouye, president of the U.S.-Japan Council and founding CEO of JANM, made an appeal for JANM’s Bid for Education: “My late husband, U.S. Sen. Dan Inouye, was the chair of JANM’s Board of Governors for many years … Whenever he would visit the museum, his greatest joy was to see yellow school buses lined up on First Street and to walk through the exhibits and the galleries and see the students of all ages captured by the stories being shared by the museum’s many docents. He knew the future was being safeguarded by sharing the lessons of the past and its relevance for today and for tomorrow. The lights were dimmed and the audience was asked to hold up the LED candles at their tables. “Each candle reminds us of the Issei, Nisei and Sansei who have gone before us … a reminder of our commitment to protect justice and equality,” Maki said. The Lexus Opportunity Drawing was conducted by two representatives of Toyota Motor Sales USA Inc.: Tracey Doi, group vice president and CFO, and Tammie Kanda of Corporate Community Relations. The winner was Andy Chun of San Jose. Nancy Matsui, national account manager for American Airlines, conducted a drawing for airline tickets. The winner was Mark Hutchins of Los Angeles. The dinner was preceded by a silent auction and followed by an after party at the BonaVista Lounge on the hotel’s 34th floor. 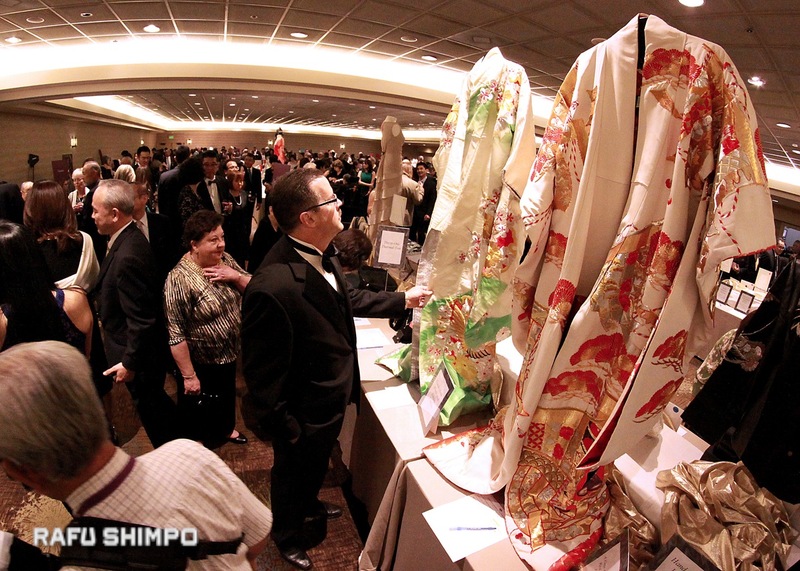 The silent auction, held before the dinner, featured a wide variety of items.